This is a review that was taken from the Ultimate TV webpage. "That 70's Show?" No, Those 70's Kids! Think "Felicity" has the biggest new cast out there? 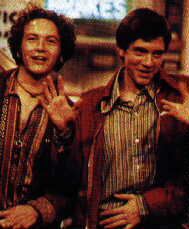 Think again -- most TV series are thinking young, and FOX's "That 70's Show" is no exception. Take a bunch of fresh new faces, throw them in a time warp to the 1970s and what do you get? Let's just say this barrel is overflowing with monkeys. And monkeys dressed in flared blue jeans and polyester shirts, at that. This period sitcom is too new to tell who the stand out will be, but UltimateTV is betting on the captivating next-door neighbor Donna Pinciotti (Laura Prepon) and the conspiracy theorist Steve Hyde (Danny Masterson). Masterson is the most familiar face of the circle of friends, coming off two seasons on "Cybill" as Alicia Witt's love-interest. The rest of the fresh faces include Topher Grace, Wilmer Valderrama, Ashton Kutcher and Mila Kunis. This show promises to be a hit, and the cast of newcomers, who no one recognizes as 90s staples, will probably be stuck in the 70s for many years to come. God help 'em. "That 70's Show" premiere August 23 on FOX.